Some countries are located so close to the continental lines that it is difficult to see which they are a part of. Egypt is a great example of this as parts of this country has territory on the continent of Africa and the continent of Asia. 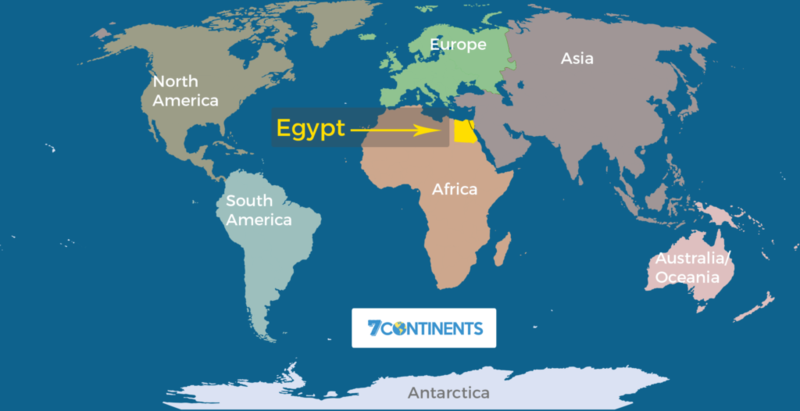 Egypt is a Mediterranean country that is situated in both the northeastern corner of the African continent and the southwestern portion of Asia, making Egypt a contiguous transcontinental country which means that the country has territory on more than one continent. The geographical coordinates of Egypt range from 24.09082 to 31.5084 latitude and from 25.51965 to 34.89005 longitude. The Suez Canal runs through the middle of Egypt and serves as the dividing line between the two continents. Bordering countries include Israel at the northeastern border, Libya to the west, and Sudan to the south. Egypt is bordered by the Red Sea to the west and the Gulf of Aqaba to the east. The part of Egypt that lies on the Asian continent is the Sinai Peninsula. The majority of Egypt is located on the African Continent (including all of its major cities) which is why most would say that Egypt is part of the continent of Africa. 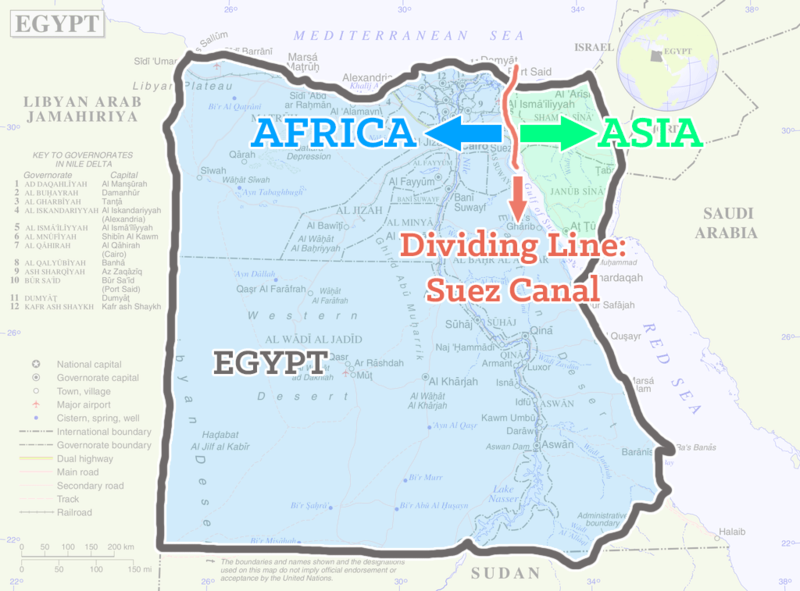 The map below shows how the Suez Canal divides the country of Egypt. The larger portion to the west falls in Africa while the smaller portion on the eastern side of the Suez falls in Asia. With over 88 million citizens living within its borders, Egypt has the 16th largest population count on the planet. Egypt’s capital city, Cairo, is a sprawling metropolis set primarily on the banks of the Nile River and has a population of more than 7 million. The country’s next largest city, Alexandria, boasts 3.8 million people, and the third largest, Al Jizah, has 2.4 million inhabitants. There are 34 more cities situated within Egypt’s borders that have populations of over 100,000 people. Approximately 57 million citizens of Egypt live in towns with populations of less than 100,000 or in rural areas. The majority of Egypt’s land mass is desert. However, the country’s extremely fertile Nile Valley is where 99 percent of the country’s people actually live. Without the mighty Nile, all of Egypt would be desert. At 4,160 miles, the Nile River is one of the longest rivers on Earth. Although commonly associated with Egypt, the Nile actually spans 11 countries, including Kenya, Ethiopia, Rwanda, Tanzania, and Uganda. The Nile River flows south to north throughout the entire country of Egypt. The extremely verdant Nile Valley has provided Egypt with an abundance of agricultural wealth since ancient times. The annual flooding cycle of the river was pivotal in the Nile Valley’s establishment as a major agricultural center. The Nile River also served as a highway that joined the region together to the extent that land travel was virtually unknown prior to the 19th century. Four physical regions exist within Egypt’s borders. 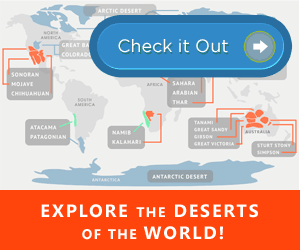 They are the Nile Valley, the Western Desert, the Eastern Desert, and the Sinai Peninsula. As mentioned previously, the Sinai Peninsula is the only portion of the country that’s located on the Asian continent, and the Nile Valley runs from the northern to the southern border of Egypt. The Western Desert area extends from the Nile Valley to the eastern border of Libya, and the Eastern Desert ranges east from the Nile Valley to the western shores of the Red Sea. Egypt has a hot desert climate that’s extremely arid with the exception of the land along the northern coast of the Mediterranean Sea, where significant rainfall occurs during the winter months. The top of Mt. Sinai, which is situated on the Sinai pendular and rise to more than 7,000 feet above sea level, is often dusted with seasonal snowfall. Ancient Egypt was one of the earliest civilizations on Earth and has more 6,000 years of recorded history under its belt. Long renowned for amazing hieroglyphs, mysterious, majestic pyramids, the inscrutable Great Sphinx of Giza, and the temple of Abu Simbel, Egypt cultivated and maintained a vibrant culture that profoundly influenced the arts, customs, and social institutions of emerging nations in the Middle East, Europe, and the African continent. Even today, many aspects of ancient Egypt interact with modern elements. For instance, the pyramid form remains an essential component in present-day architecture in Egypt. Ancient Egyptian scholars also pioneered the concept of the phonetic alphabet, which has served as the foundation for all Western languages. Paper also has its roots in ancient Egypt, and Egyptian scientific culture provided the groundwork for Western medicine. Surgical tools were found when the Tomb of Qar was opened in December of the year 2006. Today’s Egypt is a combination of past and present and encompasses a wide mixture of traditions. Modern skyscrapers loom toward the sky next to historic mosques in a complex cultural tapestry, offering an opportunity to experience both worlds at once that is only found in a very few other places on planet Earth.